A highly body-conscious culture is reflected in the fact that consumers are more concerned about looks and appearance than their general health. According to new research by Datamonitor Consumer, nearly a third of consumers who are actively trying to lose weight are concerned about cellulite. In contrast, only 15% are concerned about diabetes. 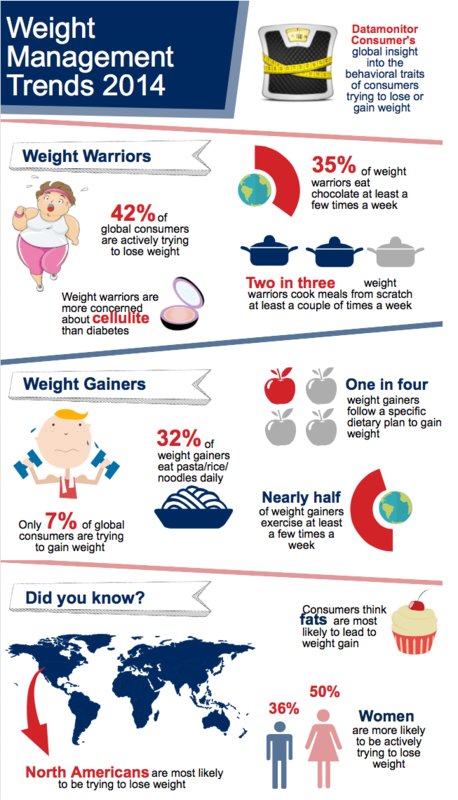 Datamonitor Consumer has created an infographic which offers a snapshot of some of its research findings on different behavioral traits of consumers trying to lose or gain weight. Datamonitor Consumer’s global survey 2014 explores consumer behavior and opinion across 25 countries. We’ve surveyed 25,000 consumers about their food, drink, personal care, household care and baby care product usage, level of spend, and purchasing behavior. The survey also analyses consumer concern across a wide range of dietary, health and beauty issues. Are you ignoring deadly signs of diabetes? Each year diabetes is responsible for 24,000 premature deaths in England and Wales yet many of those at risk of developing the condition are in denial. Even when they have one or more of the recognisable symptoms, they do not take these seriously and fail to mention them to their doctor. People’s inaction puts their long term health in jeopardy, because if left untreated diabetes can dramatically increase their chances of developing heart disease, suffering a stroke or going blind. It is also the primary trigger for lower limb amputation, warns Dr Gill Jenkins. “If you have pre-diabetes it’s silent, there are no symptoms and a shocking number of people are in this position and are sleep-walking towards serious health problems. It is particularly important to be aware of your risk of developing type 2 diabetes especially if you’re overweight or you have a family history of diabetes,” says Jenkins from the Simplyhealth Advisory Research Panel (ShARP). New research commissioned by ShARP, among 2,000 Britons, aged 18-70, found that more than 60% of the respondents were unconcerned about the possibility of developing blood sugar problems such as Type 2 diabetes with 40% admitting they knew very little about the condition. Worryingly almost half – 49% – were already displaying one or more of the symptoms and one in three had a waist measurement that put them at increased risk. This refusal to face reality may explain why experts believe there are more than 630,000 people in the UK who don’t realise they have Type 2 diabetes. Over time, diabetes increases the risk of atherosclerosis – the narrowing of blood vessels that reduces blood flow to the heart. This means that people with diabetes are five times more likely to have a heart attack or stroke. One in four hospital admissions for heart failure is due to diabetes but 36% in the ShARP poll had no knowledge of this link between the condition and heart disease. Diabetes also damages nerves, which is why people with the condition are more likely to suffer from foot ulcers and are at higher risk of amputation. Every week in the UK there are more than 100 lower limb amputations due to the condition. Yet 40% of those in the ShARP survey were unaware that people with diabetes are 20 times more likely to lose a limb than those who do not have it. “Every day lives and limbs are being lost to diabetes, but what is heartbreaking is that in so many cases these personal tragedies can be prevented,” says ShARP advisor, Dr Gill Jenkins. While almost half of those surveyed, 49%, had one or more symptoms of the condition – excessive thirst, frequent urination, tiredness, dry mouth – 38% of them wrongly believed these early warning signs were not serious and in many cases had failed to mention them to their doctor. “These statistics show that far too many people are heading for problems by refusing to face the facts. When it comes to diabetes, ignorance is not bliss. It is potentially deadly,” Dr Gill Jenkins, ShARP adviser says. Scans of the brain at the Mayo Clinic in the US confirm that blood sugar problems can literally shrink the brain. On average those with diabetes had 2.9% less brain volume than those without the condition. The difference was most marked in the hippocampus – the region of the brain that holds long-term memory and the ability to recall recent events. Getting Type 2 diabetes in middle age therefore increases the chances of developing a form of brain damage that is linked with dementia. There are around 3.8 million people in the UK with diabetes and this figure is expected to rise to 5 million by 2025. Already the condition is pushing the cash-strapped NHS to crisis point. It spends £13.8 billion a year treating people with the condition – the equivalent of £25,000 a minute – and 10% of its drugs bill goes on diabetes medicines. It costs between £300 and £370 a year per patient to treat and monitor diabetes but when a patient is admitted to hospital with complications this figure jumps to between £1,800 and £2,500. Regular health checks and treating minor problems before they become major issues can reduce hospital admissions and serious complications for the patients. “We need all our clinicians, GPs, practice nurses, community nurses and hospital teams, to focus on the risks of pre-diabetes‎ and enable patients to reduce their risk of heading into diabetes itself, the costs of such focus are well worth it in long term outcomes” warns Dr Gill Jenkins from ShARP. According to a study by the Medical Research Council, more than a third of the UK adult population is overweight and at increased risk of diabetes but they are not being systematically monitored for the condition. Four out of five interviewed for the ShARP survey claimed their GP or practice nurse had never discussed the risk of developing diabetes with them. A study in the Journal of Epidemiology and Community Health calculated that over a decade every kilogram of added weight increases the risk of developing diabetes in the subsequent 10 years by 49%. In the ShARP survey two out of five respondents admitted they were overweight. Waist measurements also indicate whether someone is at risk. One in three had a waist measurement putting them in the danger zone – 31.5 inches or more for women and 37 inches or more for men. Moderate intensive aerobic activity such as brisk walking or cycling every week cuts the risk. A recent study that tracked 100,000 women for eight years reported that this level of activity reduced their chances of developing diabetes by 40%. Evidence is also emerging that following a very low calorie diet can cure Type 2 diabetes. A small study at Newcastle University found that seven out of 11 patients with the condition were cured after cutting their food intake to 600 calories a day for eight weeks. Two out of five respondents believed they were not at risk of developing diabetes because they avoided sugar not realising it is total calories consumed that count. While sugar consumption has fallen by 6% in the past decade, in that period the number of people with diabetes has increased by 61%. And 13% in the ShARP poll were sceptical that diet and exercise can reduce the risk but studies show that over a ten year period every kilogram of weight lost cuts the risk by a third. A widely-held misconception is that only old people develop Type 2 diabetes but it can occur at any age. Around 500 children in the UK have it and another 2,000 children and young people are estimated to be suffering from Type 2 diabetes but have yet to be diagnosed. TYPE 1 DIABETES occurs when the cells which make insulin are destroyed and the pancreas is unable to make insulin. It is the most common form in childhood and is rarely diagnosed after the age of 40. It is sometimes called insulin-dependent diabetes. People with Type 1 diabetes have to rely on regular insulin injections. Around 10% of people with diabetes have Type 1 diabetes. the diabetes. In some cases diet and exercise alone will resolve the issue, in others insulin is required. Between 85% and 95% of all diabetes is Type 2. Philadelphia: Fruits with stones, such as peaches, plums and nectarines, help protect against several ageing diseases, according to new research from the US. The findings of research scheduled for presentation at the 244th American Chemical Society meeting, to be held August 19-23, 2012 in Philadelphia, reveal a protective effect from consuming these fruits, against against metabolic syndrome–a cluster of factors that predict obesity-related diabetes and/or cardiovascular disease. Texas AgriLife Research food scientist Dr Luis Cisneros-Zevallos said: “In recent years obesity has become a major concern in society due to the health problems associated to it. “In the US, statistics show that around 30 percent of the population is overweight or obese, and these cases are increasing every year in alarming numbers. “The major concern about obesity is the associated disease known as metabolic syndrome,” he observed. “Our studies have shown that stone fruits – peaches, plums and nectarines – have bioactive compounds that can potentially fight the syndrome, ” Dr Cisneros-Zevallos reported.” Our work indicates that phenolic compounds present in these fruits have antiobesity, anti-inflammatory and antidiabetic properties in different cell lines and may also reduce the oxidation of bad cholesterol LDL. “Our work shows that the four major phenolic groups–anthocyanins, clorogenic acids, quercetin derivatives and catechins–work on different cells –fat cells, macrophages and vascular endothelial cells,” he continued. “They modulate different expressions of genes and proteins depending on the type of compound. However, at the same time, all of them are working simultaneously in different fronts against the components of the disease, including obesity, inflammation, diabetes and cardiovascular disease. “Each of these stone fruits contain similar phenolic groups but in differing proportions so all of them are a good source of health promoting compounds and may complement each other,” he concluded. What’s good for the planet is good for us…. A low carbon lifestyle means better health for all of us. Eating less meat could save 45,000 lives in the UK each year. Experts have banded together to point out the connection between climate change and our bad health. They believe our meat-heavy diets and obsession with cars is leading us to a sticky end. An article published simultaneously in the BMJ, the Lancet and the Finnish Medical Journal today, warns that the links between climate policy and health policy must not be overlooked. The environmental organisation, Friends of the Earth, agree; they told us that 45,000 UK deaths could be prevented each year with lower meat diets, saving the NHS £1.2 billion. Celebrities such as Paul McCartney and Helen Baxendale have also given their support to campaigns aiming to reduce meat consumption. For more meat facts see the end of this article. Written by Robin Stott and Ian Roberts on behalf of the Climate and Health Council, it is a call to action for health professionals across the world to help tackle the health effects of climate change. Failure to agree radical reductions in emissions spells a global health catastrophe, they say. Later this month, representatives from countries around the world will meet at the 2010 United Nations Climate Change Conference in Mexico. They argue that moving to a low carbon economy “could be the next great public health advance.” For example, a low carbon economy will mean less pollution and a need for more physical activity. A low carbon diet (especially eating less meat) and taking more exercise will mean less cancer, obesity, diabetes, heart disease, and even depression. 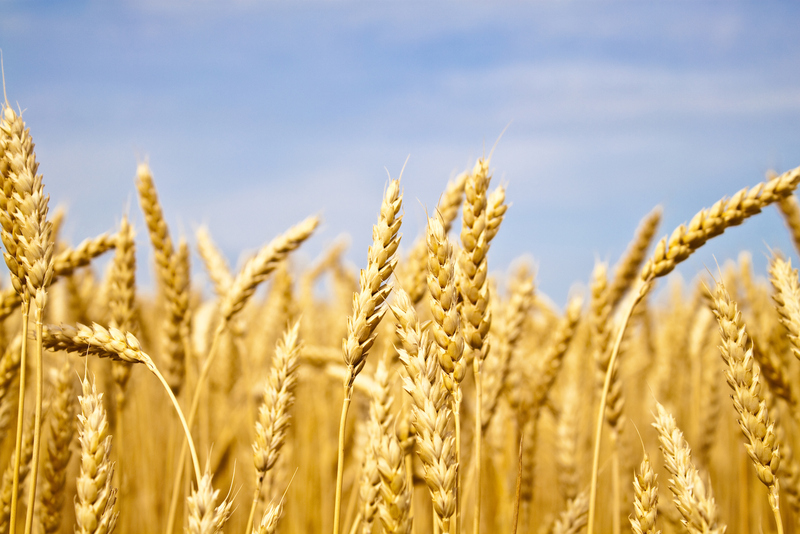 A reduction in car use and meat consumption would also cut world food prices, they add. They believe that health professionals everywhere have a responsibility to put health at the heart of climate change negotiations. “Responding to climate change could be the most important challenge that health professionals face,” they say. [v] Simopoulos AP, Omega-6/omega-3 essential fatty acid ratio and chronic diseases, Food Rev Intl, 2004; 20(1): 77-90. Low testosterone levels seem to be linked to a heightened risk of premature death from heart disease and all causes, suggests research published online in Heart journal. This finding refutes previous research published on the subject, which had indicated that the hormone is a risk factor associated with cardiovascular disease. The heart health of 930 men was tracked over 7 years, after each had been diagnosed with having coronary artery heart disease. Low testosterone levels were fairly common in these men; one in four were also diagnosed as having clinically defined testosterone deficiency. This is known as hypogonadism and does not refer to men with declining levels of testosterone due to advancing age. During the monitoring period almost twice as many men with low testosterone died as did those with normal levels. One in five (41) of those with low testosterone died, compared with one in eight (12%) of those with normal levels. It was found that those men with a borderline- low level of testosterone were also at an increased risk of early death. The authors have pointed out, while high doses of testosterone delivered by anabolic steroids are hazardous to the health, low rather than high testosterone levels are connected to a whole host of health problems, including obesity and insulin resistance – known risk factors for diabetes and heart disease. The authors of the study, based at Royal Hallamshire Hospital in Sheffield, have concluded that men with hypogonadism (also at increased risk of the abovementioned conditions) could benefit from testosterone replacement. A response to this study has highlighted the need for further research into the impact of testosterone on the health of both men and women. The impact or connection of testosterone levels on heart disease has largely taken a backseat, with researchers focusing on the impact of the female hormone Oestrogen until recently. High testosterone has been linked to a variety of heath issues in women – including increased risk of developing diabetes and cardiovascular disease. If you would like to read more about the impact of low and high testosterone levels you can take a look at the recently released research, links below. New York: Trials of a Danish-made injectable drug called liraglutide (trademark name Victoza) have revealed that it reduces weight and the prevalence of cardiovascular risk factors in obese people without diabetes. High doses of liraglutide, were also found to cause greater weight loss than orlistat (marketed over-the-counter as Alli), according to a report in the medical magazine, The Lancet. In developing countries obesity levels have risen dramtically in the past two decades and in some European countries 30% of the population are overweight. Around 50% of all adults in Europe are classified as overweight. Obesity increases the risk of degenerative diseases including high blood pressure, diabetes, and atherosclerosis, and all risk factors for heart disease. Moreover, obesity is associated with a reduced quality of life. Few safe and effective drugs are currently available for the treatment of obesity. Therefore, alternative approaches to weight loss that are safe and well tolerated and that can lower the risks associated with obesity are needed. In this randomised controlled trial, the authors studied the effect of liraglutide on bodyweight and tolerability in obese individuals without type 2 diabetes. The study, led by Professor Arne Astrup, Department of Human Nutrition, University of Copenhagen, Copenhagen, Denmark, took place in 19 sites in Europe, and analysed 564 people (18-65 years, body-mass index 30-40 kg/m²). Each was assigned to 1 of 4 liraglutide doses (1.2 mg, 1.8 mg, 2.4 mg, or 3.0 mg, n = 90-95) or to placebo (n = 98) administered once a day subcutaneously, or to orlistat 120 mg (n = 95) administered orally 3 times a day. All participants also followed a calorie-restricted diet, which contained approximately 500 calories less than they needed each day. Participants also increased their physical activity throughout the trial, including the 2-week run-in. Participants on liraglutide lost significantly more weight than did those on placebo and orlistat. Mean weight loss with liraglutide doses 1.2, 1.8, 2.4 and 3.0 mg was 4.8 kg, 5.5 kg, 6.3 kg, and 7.2 kg respectively, compared with 2.8 kg with placebo and 4.1 kg with orlistat. A higher proportion of individuals (76%) lost more than 5% weight with liraglutide 3.0 mg than with placebo (30%) or orlistat (44%). 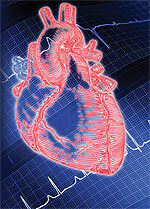 Liraglutide reduced blood pressure at all doses. At the start of the study, around one-third of patients in each group had pre-diabetes, that is, poor blood glucose control not yet bad enough to qualify as diabetes. Liraglutide reduced the prevalence of pre-diabetes (84%-96% reduction) with 1.8-3.0 mg per day. They add that further studies, with longer follow-up than 20 weeks, are now needed to establish the long-term risk-benefit profile for liraglutide. Grapefruit may hold key to anti-obesity pill? Toronto: A substance found in grapefuit could become a key ingredient in fighting obesity and diabetes, according to a new study. Naringenin, a flavonoid found in citrus fruit such as grapefruit which gives it its bitter taste , makes the liver burn fat instead of storing it. But high concentrations, far more than is available in the fruit, would be needed to achieve fat-busting benefits. The chemical also helps balance insulin and glucose levels. If it could be made into a tablet then it could help treat patients suffering from Type 2 diabetes, a main cause of heart disease. Successful tests have already been carried out on mice by researchers at the Robarts Research Institute at the University of Western Ontario, in Canada, and published in the journal Diabetes. Two groups of mice were both fed the equivalent of a Western diet to speed up their metabolic syndrome – the process which leads to Type 2 diabetes in humans. One of the groups ate food that had been treated with naringenin. The non-naringenin mice became obese, their cholesterol levels rose and their bodies became resistant to insulin, a hormone that regulates blood sugar levels. The mice given the chemical did not suffer from these ailments, despite eating identical diets to the others. Any rise in cholesterol-was corrected by the naringenin which also reprogrammed their livers to burn fat rather than store it. Lead researcher Professor Murray Huff added: Furthermore, the marked obesity that develops in these mice was completely prevented by naringenin. What was unique about the study was that the effects were independent of calorific intake, meaning the mice ate exactly the same amount of food and the same amount of fat. The team will now try to develop the chemical into a treatment for humans. Note: anyone taking medication should be wary of eating grapefruit as it may interfere with the effect of drugs, such as as statins. Glasgow: Taking regular lunchtime siestas could increase the risk of developing Type 2 diabetes, according to the findings of a research study being presented this week at leading health charity Diabetes UKs Annual Professional Conference in Glasgow. Researchers¹ looked at the napping habits of 16,480 people and found that diabetes prevalence increased with napping frequency. The study found that those who napped had a 26 per cent greater risk of developing Type 2 diabetes compared to those who never napped. The researchers believe several factors may be behind the link, including an association between napping and reduced physical activity. In addition, napping during the day may disrupt night-time sleep which could have an impact as short night-time sleep duration has been shown to be associated with increased Type 2 diabetes risk7, 8,9. Waking up from napping activates hormones and mechanisms in the body that stop insulin working effectively. This could also predispose people to Type 2 diabetes which can develop when the insulin the body makes does not work properly. Dr Iain Frame, Director of Research at Diabetes UK, said: We know from previous studies that looked at the link between disturbed night sleep patterns and the risk of developing Type 2 diabetes that interrupted sleep at night could increase the risk of developing Type 2 diabetes. We already know that people who are overweight or obese, and therefore more at risk of developing Type 2 diabetes, can have problems sleeping. This new research could be another step towards explaining the possible link between disturbed sleep patterns and Type 2 diabetes. Diabetes is a serious condition that can lead to long-term complications such as heart disease, stroke, blindness, kidney failure and amputation. Short-term complications include hypoglycaemic episodes, known as hypos, which can lead to unconsciousness and hospitalisation if left untreated, and persistent high blood glucose levels can lead to diabetic ketoacidosis (DKA) which if untreated can be fatal. Research conducted by scientists from the University of Birmingham and from Guangzhou Hospital, China. S taheri, CQ Jiang, KH Lam, T Arora, WS Zang, KK Cheng, NG Thomas and TH Lam. P16. Napping is associated with increased risk of diabetes: the Guangzhou Biobank Cohort Study. The Diabetes UK Annual Professional Conference (APC) is taking place from 11 to 13 March 2009 at the Scottish Exhibition and Conference Centre (SECC), Glasgow. It is the UKs largest diabetes conference with over 3,000 healthcare professionals attending. Diabetes UK is the leading charity for the three million people in the UK with diabetes. It is our 75th Anniversary in 2009 and events to mark this special occasion will be taking place around the country. We aim to spend more than £8 million on research in 2009 as well as campaigning and providing information and support. In the UK, there are currently 2.5 million people diagnosed with diabetes and it is estimated that up to half a million people have the condition but do not know it. The Diabetes UK Careline (0845 120 2960) offers information and support on any aspect of managing diabetes. The line is a low cost number and opens Monday to Friday between 9am and 5pm (operates a translation service). Recorded information on a number of diabetes-related topics is also available on this number 24 hours a day. Membership of Diabetes UK is from £23 a year with special rates available. In addition to our bi-monthly magazine Balance, members receive support and the latest information on diabetes care and treatments to help them live a healthy life. Authors: Spiegel K. Knutson K. Leproult R. Tasali E. Van Cauter E. Title: Sleep loss: a novel risk factor for insulin resistance and Type 2 diabetes. [Review] [98 refs] Source: Journal of Applied Physiology. 99(5):2008-19, 2005 Nov. Authors: Vigg A. Vigg A. Vigg A. Title: Sleep in Type 2 diabetes. [see comment][retraction in Joshi SR. J Assoc Physicians India. 2004 Jul;52:530; PMID: 16189926]. Recent study results suggest that taking a high-dose vitamin B1 supplement each day may help diabetics reduce their risk of kidney damage. Diabetic nephropathy, or kidney disease, is a common complication of type 2 diabetes. An early indicator of kidney disease is microalbuminuria, where the kidney leaks albumin into the urine. New research examined whether vitamin B1 would effect microalbuminuria and the results sugest it can reverse the onset of early diabetic kidney disease. In the trial type 2 diabetics were given 300 milligrams of vitamin B1 (thiamine) each day for three months. Results showed that the vitamin supplement reduced the rate of albumin excretion by 41%. Furthermore, 35% of patients with microalbuminuria saw their urine albumin excretion return to normal after being treated with the vitamin. London: Overweight, tired, skin problems and infertility are just some of the symptoms of food intolerence. Many people suffer from food sensitivities /intolerencewithout knowing it. A food sensitivity is a reaction that you may not notice directly, symptoms may appear days after eating the substance, but it may be responsible for various “minor” illnesses such as chronic fatigue, overweight, chronic inflammation, migraine, arthritis, skin problems, poor mood and attention span, breathing difficulties, gastro-intestinal orders such as Irritable Bowel Syndrome, sugar cravings, premature ageing, infertility and other conditions. This is different from a true allergy in that the reaction to the offending substance will usually happen immediately. The ALCAT test examines the reaction of your living blood cells to foods and other substances so that you can tailor your diet for optimum health. This is not a test for true allergies. The IGE/IGG antibody response test is more suited to allergies. The ALCAT test can also be used to screen for a whole host of substances that IgG cannot; such as, food additives and colourings, moulds, environmental chemicals, certain common anti-inflammatory drugs and antibiotics. The ALCAT test, requires the patient to give a blood sample and examines the reaction to 100 most common foods costs £199.99(includes VAT). The Alcat Test is unique. Your Alcat test results are contained in a detailed report of the bodys reaction to 100 common foods and substances including wheat, yeast and dairy. * These are category coded: red (severe intolerance, avoid at all costs for six months), orange (strong intolerance, avoid for 3-6 months), yellow (mild intolerance, avoid for three months/eat on rotation), green (acceptable, eat on rotation). Even when dieting, the foods you eat may be preventing you from losing weight. Recent information has shed light on why some people will benefit from a diet and others will not. Our immune system reacts to the foods we eat and reactions to particular foods affect each of us differently. In a study from Baylor Medical College in the US, researchers examined the effects of avoiding offending foods, or what is commonly referred to as hidden food allergies, were compared with low calorie dieting. The researchers were not only looking for changes in scale weight, but also a much more important measurement called body composition. Body composition is the ratio of fat to lean tissue. It is an important concern with regard to weight loss because the loss of lean tissue, as opposed to fat, is unhealthy. Lean tissue burns calories, even when youre not exercising. Loss of lean tissue, rather than fat, can set you up for the yo-yo diet effect. In order to determine a persons hidden food allergies the Baylor researchers used a simple blood test, developed by ALCAT. They collected 100 subjects for the study who were having difficulty losing weight. Half of the subjects followed their Alcat test results and ate whatever they wanted as long as it was not indicated by the test as being a problem food. The other fifty subjects restricted their caloric intake, but did not eliminate problem foods indicated by the Alcat test. Measurements of scale weight and body composition were taken at the beginning of the study and again one month later. The difference between the two groups was startling, 98% of the subjects following the Alcat eating program were successful in either losing weight and/or improving body composition. The calorie restriction group as a whole actually got worse, not necessarily heavier, but they lost more muscle than fat. To the researchers, this study demonstrated that merely restricting food intake, without eliminating foods that inhibit metabolism, will not enough improve metabolic function necessary for healthy and long lasting weight loss. Many doctors use the Alcat test as a valuable weight loss tool. Dr. Steven Lamm, author of, Thinner at Last, says, I have seen the (Alcat) technique work when absolutely nothing else has made the scale budge. Even low carb advocates like Dr. Fred Pescatore, the former associate Medical Director of the Atkins Center and author of the bestseller, The Hamptons Diet, says, Ive been using the Alcat test in my practice for eight years. No other test is as accurate or useful. Helskinki: Scientists have discovered that higher levels of vitamin D may offer protection against tyep 2, adult onset diabetes. Several thousand people, aged 40 to 74, were monitored over a 22-year-period, during which time 412 developed the disease. Results showed that those with higher levels of vitamin D had the lower risk of diabetes. In particular, men with the highest blood level of the vitamin were 72 per cent less likely to develop the disease. It is thought that low levels of vitamin D affect the body’s ability to produce insulin. Vitamin D is produced naturally in the body by sunlight and it is also found in certain foods such as oily fish. Diabetes is a growing problem, particularly in ageing adults and those who are overweight, particularly with high levels of belly fat are most at risk. Lexington: People at high risk for developing type 2 diabetes might be able to delay or prevent the disease by taking certain food supplements and making lifestyle changes, according to a new book. Diabetes is a worldwide epidemic, and it is growing at an alarming rate. In 2006, the United Nations declared it an international health threat comparable to HIV/AIDS. However, emerging evidence suggests that risk of diabetes can be reduced by a combination of weight loss, exercise, dietary changes and the use of supplements called “nutraceuticals,” extracts of certain foods purported to have a physiological benefit or provide protection from disease. 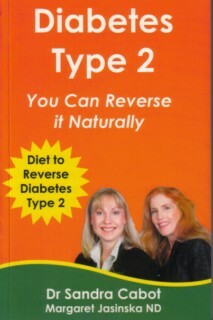 The book, “Nutraceuticals, Glycemic Health and Type 2 Diabetes,” by Dr James Anderson, an international authority on metabolic diseases, and professor emeritus of medicine and clinical nutrition, provides an overview of glycemic health and highlights the use of nutraceuticals in the prevention and management of type 2 diabetes. Anderson identifies dietary fiber from whole grains as one of the strongest preventive measures for type 2 diabetes. The book also offers an in-depth discussion on certain minerals and herbs that assist in achieving tighter glycemic control. Anderson collaborated with Vijai K.Pasupuleti, founder of SAI International  a firm engaged in research, consulting and marketing for nutraceutical, pharmaceutical and biotechnolgy companies  to summarize cutting-edge research from all over the world and assemble the outcomes. Thirty-five scientists from nine countries contributed 18 chapters presenting the latest findings on the role of nutrition in diabetes. This emerging evidence will allow health care providers to offer the latest in nutrition guidance to patients with diabetes. It will encourage producers of foods and supplements to make active ingredients more widely available to consumers, and will enable self-directed individuals to make intelligent choices about nutrition supplements to prevent diabetes. In the closing chapter Anderson provides practical guidelines based on his clinical experience, his research and the research presented in the book. He gives recommendations for specific amounts of minerals to slow progression of diabetes or reverse diabetes in its early stages. Over 100 herbal supplements are evaluated and 11 are assessed to be of potential value for treatment of early diabetes. Anderson and his colleagues have been doing research on nutrition and diabetes for 35 years at UK and he has published over 100 research papers on this topic. Sydney: Scientists in Australia have found conclusive evidence that a high GI diet, generally rich in food that is burnt by the body quickly, leads to a higher risk of common lifestyle diseases. The Glycemic Index (GI) is a measure of how different foods affect your blood glucose levels, with those that are “low GI” released more slowly and deemed better for health. This slow release means that less insulin is released into the bloodstream and the body’s stores less fat. A team of nutrition experts at the University of Sydney evaluated 37 diet studies involving nearly two million people worldwide to analyse the effect of eating high GI foods, which are usually highly processed. The study, published in the American Journal of Clinical Nutrition, found a link between a high GI diet and a high risk of type 2 diabetes and heart disease.The diet was also linked to gall stones and some types of cancer. He said the link with diabetes was “not surprising” because eating high GI foods inflates your blood glucose and insulin levels. “You may literally ‘wear out’ your pancreas over time and eventually it may lead to type 2 diabetes in older age,” Mr Barclay said. The researchers were more surprised by the “strong relationship” between GI and cancer. High GI foods cause constant spikes in blood glucose which increase insulin and a related substance called ‘insulin-like growth factor one’, both of which have been shown to increase the risk of developing cancer. “Other research shows that a high GI diet tends to reduce ‘good’ HDL cholesterol levels and raise triglycerides levels; bad news for cardiovascular diseases,” he said. The researchers said their findings support eating a low GI diet to maintain healthy weight and help avoid disease. Caryl Nowson, a professor of nutrition and ageing at Deakin University in Melbourne, said because high GI foods were typically high in fat and sugar and low in fibre, they were also ready known to be linked with disease. “This review is just a new way of breaking down dietary information we already have,” Prof Nowson said. She said while the benefits of eating according to GI rating had been proven, it was just one of many ways to structure a healthy diet. “If you focus on having a classically balanced diet high in fibre and low in sugar, fat and refined foods you’ll find you’re eating relatively low GI anyway,” Prof Nowson said. London: Nearly half the population (45%) do not realise that too much saturated fat (SAFA) is bad for their health. This latest research from independent UK body, The Fat Panel, also reveals that whilst one in seven fail to link coronary heart disease with excessive SAFA intake, nearly one in four believe that reining in saturated fat consumption will improve their love lives. These findings re-enforce the panels claims that Brits do not understand fats  unaware of which are good and which are bad for their health. As a result, on average the UK eats 17% too much saturated fat; raising the risk of developing cardiovascular disease. In view of this, the Food Standards Agencys (FSA) has commissioned a consultation on how to reduce the nations intake of saturated fat and energy. Most of us should be worrying less about the amount of fat we are consuming, and more about what types of fat were including in our diets. The research is worrying, as it shows that many of us are still unaware of the risks of eating too much saturated fat, despite health professionals and academics long-term concerns backed by a wealth of clinical evidence, said Dr Sarah Berry of The Fat Panel. Its good to see the Government shining a spotlight on this harmful fat. If it hopes to see a reduction in the amount of saturated fat that people are eating, we need to help people to understand SAFA and why its so bad for your health. There is a lot of public confusion over which foods are high in saturated fat, making it difficult for the public to know which fats and foods they should avoid or cut down on. More than one third of those questioned (35%) believes that sunflower oil is high in saturated fat (it contains just 12%), whilst more than one quarter think that rapeseed oil is high in this bad fat (it contains just 8% saturated fat). Nearly one in 10 of those questioned do not realise that butter is high in saturated fat. A further one in eight does not think cakes and biscuits have a high SAFA content. In addition, one in 10 are unaware of meat products, such as meat pies and sausages, containing high levels. Sian Porter of The Fat Panel says By understanding that saturated fat is bad for the body, the next step is for people to recognise which foods contain these. Snacks such as cakes, biscuits and pastries contain high levels  but this can easily be rectified by simply swapping these for healthier options like fruit or even toast with spread  which on average contains 25% less saturated fat. Its all about education, and having the knowledge to make informed  and as a result  healthier choices. Recent moves on food labelling should help people make these choices; however just half of us even look at the on-pack information when buying butter or spreads for instance, and only one in six look at how much saturated fat is in the pack. When thinking about saturated fat content, all spreads are at least 25% lower in saturated fat than butter and some contain much less with certain spreads offering up to 83% less saturated fat. More and more people are opting for low-fat products, whether on health or diet grounds, but it seems like few consider what type of fat a product contains. Dr Berry is a registered nutritionist, working at kings College, and her specialist area of knowledge and research is lipid metabolism and coronary heart disease risk. Sian is a state registered dietician and holds an MSc in Health Economics. Dr Stillman is in general practice in Crawley, Sussex and is a general practice trainer with the British Postgraduate Medical Federation. Dr Mason is a nutritionist and pharmacist. Dr Steele is a general practitioner and is the regular ‘doc’ on ITV’s ‘This Morning’ show. He is Health Journalist of the Year. Dr Kirby is a GP in Cardiff, with specific experience in community paediatrics. Research was undertaken by Kember Associates with adults across the UK. Boston: Regular exercise is more important than genes if you want to live a longer life, according to new US research. Risk factors such as smoking, diet and health account for three quarters of the variations in lifespan. Only one quarter is down to genes. The research published in the Archives of the Internal Medicine Journal, studied a group of men aged 72 over a period of four years. A figure of 40 per cent lived to the age of 90 or more. It was found that those who were overweight, with diabetes, hypertension and who smoked had a reduced life expectancy while those who reached 90 were in better physical shape. A 70-year-old who does not smoke, has normal blood pressure and weight, without diabetes and who exercises two to four times a week has a 54% chance of living to 90. As a lack of vitamin D is linked to various diseases including the return of rickets, cancer, heart disease, tuberculosis and diabetes. Since it is produced in the skin on exposure to sunlight, those living in Scotland and the North of England are more likely to suffer deficiency. Experts recommend between five and 25 micrograms per day, however, 90 per cent of adults in the UK make less than three. The situation is worst for those north of Birmingham where the sun is too weak in winter for the vitamin to be produced. A recent report in the US journal Proceedings of the National Academy of Sciences revealed that people with higher levels were more likely to survive colon, breast and lung cancer. This follows last year’s University of San Diego review of 40 years of research, which revealed that a daily dose could halve the risk of breast and bowel cancer. Other claims are that it reduces the risk of heart disease (a study of 10,000 women in California found that those who took supplements had a 31 per cent lower risk of dying from it), diabetes (in a Finnish study of 12,000 children, it cut their chance of developing Type A diabetes by 80 per cent), even colds and flu (New Yorkers who took vitamin D had flu 70 per cent less often). Yet despite this increasingly compelling evidence, too many of us are not getting enough. The result: a resurgence in rickets, which stunts growth and deforms the skeleton, causing bowed legs.  90 per cent of the body’s supply of vitamin D is generated by reaction to sunlight on the skin.  Vitamin D is found in oily fish like sardines, salmon, mackerel and tuna, cod liver oil, and in milk, cheese, eggs and liver.  “Healthy Start” supplements for children up to the age of four are given free to those on benefits but can also be bought for £1.70 at pharmacies or health clinics.  The first mention of rickets is credited to Daniel Whistler, an English doctor who wrote a paper in 1645 on the subject.  Vitamin D was named in 1922 by the American biochemist Elmer McCollum, who performed experiments to find the nutrients within cod liver oil. It was so called because it was the fourth substance he identified.  One in 100 children from ethnic minorities in this country is thought to be deficient in vitamin D; darker skin requires more sun to produce the vitamin.  In 2003 a New York couple were convicted of endangering the life of their 15-month-old baby after subjecting her to a strict vegan diet which left her suffering from rickets. Silva and Joseph Swinton were sentenced to six and five years in jail.  The classic signs of rickets are bow legs caused by softening of the bones; if not detected early surgery is needed to correct it. San Francisco: Resveratrol, a substance found in red wine, may cure the symptoms of adult onset diabetes, according to the results of a new trial of a drug based on this ingredient. The American company, Sirtris Pharmaceuticals, says the trial demonstrates the drug is safe and cuts blood glucose levels, which are not controlled in diabetics, in results presented today at the 26th Annual JPMorgan Healthcare Conference in San Francisco. The findings could lead to a new drug to control Type 2 Diabetes which now affects millions and the number continues to grow. The 28-day study of pills to deliver a control, 2.5 gram or five grams of what it called SRT501 each to roughly 30 patients with Type 2 Diabetes in India. The drug is also being tested on 130 patients in a Phase 2 study in combination with metformin, a drug therapy for Type 2 Diabetes, and results are expected later this year. Any anti-ageing effects have yet to be established. The drug targets an enzyme called SIRT1, from the sirtuin family of enzymes which control the ageing process. The new drug, SRT501 acts by increasing the activity of the mitochondria, the energy powerhouse of our cells, and lowering levels of glucose in the blood and improving insulin sensitivity.